A bullet was found in an envelope in his car parked outside the Karachi Press Club in 2007. Eight years afterwards, on January 16, a bullet had almost killed him. Thanks God, he survived, so did the story. A young, slim, Asif Hasan, photojournalist working for French news agency, AFP was hit on the left side of his chest, but the bravo did not let the story go as he held the camera with one hand and stopped blood oozing out from his chest with another. This showed his commitment to his work. All well and done, but, it once did raise basic questions about the safety and training of journalists, specially photojournalists, cameraperson and other media workers in the field covering a conflict. The manner in which the bullets were fired could have hit more as some of them were busy in giving live beepers or taking visuals from precarious locations during the protest. 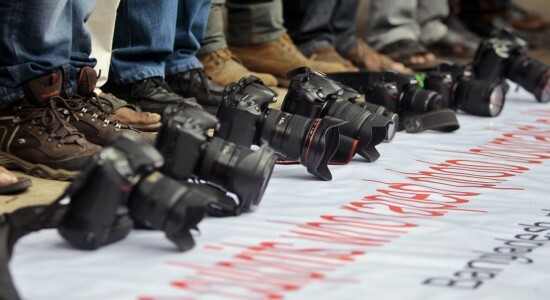 “I’m hit,” shouted Asif, as he put one hand on his chest but kept holding two cameras on the other, trying to save his photographs of the protest. Muhammad Farooq of AP, rushed towards him, put him in the nearby police mobile, abandoning his work half way just to save the life of his old colleague. Other photographers also rushed to the hospital. That day Asif had gone to cover the protest of Islamic Jamilat-e-Tulab, a student wing of Jamaat-e-Islami, against the Paris-based weekly “Charlie Hebdo,” for publishing blasphemous material. The profane material was published by the magazine after its offices were attacked last week leaving 12 people dead. The trouble started when protesters trying to reach the French Consulate in Karachi were stopped by the police. “I was scared as the bullet hit my chest. I started reciting verses from the Holy Quran,” he said. He was lucky that day since traffic was thin so he reached the hospital within 15 minutes. Dr Seemi Jamali, who in her career had seen similar cases, was going home after finishing her work, when she saw a bunch of photographers in panic. She got back to the hospital and remained there until Asif was shifted to a room after his operation. I have been reporting in this city for 34 long years and have always found her very composed even in the worst ethnic and sectarian killings and bomb blasts. The manner in which she handled victims’ families was amazing. The news of a photographer of a foreign news agency being seriously wounded started being run as a “Breaking News” by several TV channels. Some channels acted with some responsibility and did not splash his name. His family was initially informed that he is the operation theatre, and will be alright. It was only after Asif was shifted to the Intensive Care Unit, that we started discussing how he was hit; whether he was targeted because of AFP or fell victim to cross fire. Since he was standing near the police it could be “accidental” and the target might be the police. The other possibility could be that some elements might have targeted the AFP man. But, in such cases as usual there is very little possibility that anyone would be arrested or we will be able to find the “real truth”. Asif survived, so were his pictures of the protest. He did not let the camera fall till his colleague took it from him. This is how these young and brave journalists have been reporting the conflict since 9/11 in Pakistan. Over 100 lost their lives while performing their professional duties. When I saw Asif in the ICU with a smile on his face, I immediately asked myself why he was not wearing a protective jacket. Why he was standing near police and forgot the basic guideline? Was he carrying the safety kit or was it in his car or on the motorbike? Even the reporters who were covering the events were not following the safety instructions. Some were even standing in the centre, which was very risky. Anyone could have been hit. The incident also reminded me of another AFP photojournalist, Aamir Qureshi, who survived a twin car bomb blast in 2003 outside the residence of US Consul General in Karachi. He now works at a senior position in Islamabad. I doubt any criminal investigation will ever be held in this case. But, this case again highlights the fact that for all media houses need to organise more safety trainings for their workers. Asif survived and would soon be back to his work. The photographs, which he had taken, hit the newspaper pages world over. But, he must remember that no story is bigger than your life. The author is a senior analyst/columnist of GEO, The News and Jang newspapers in Karachi.